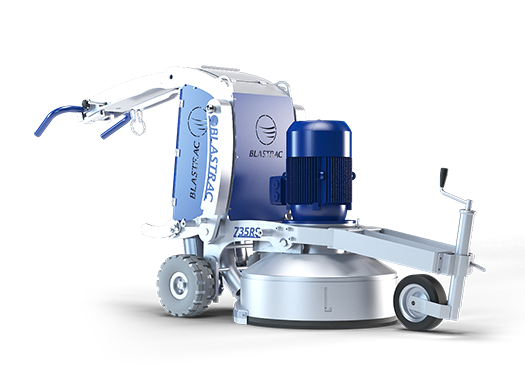 The BMG-735RS MKII is a remote controlled floor grinder with 3xØ240 mm discs & it is designed for finishing large horizontal surfaces. Same as all Blastrac grinders the BMG-735RS MKII has a solid metal construction to create the ideal weight. This triple head grinder is dust free when connected to the appropriate dust collection system. Blastrac has designed a full range of triple head grinders and diamond products, which give the opportunity to process any floor and specific application. Working width: Ø435 mm | The Blastrac BMG-435SC is our smallest triple disc grinder equipped with speed control. Working width: Ø780 mm | The BMG-780RS MKII is a remote controlled grinder which makes the machine very effective and ergonomic to operate.